The final day in May is the feast of our Lady's visit to her cousin Elizabeth, mother of John the Baptist. Elizabeth, who had been called “barren," is going to be a mother. Gabriel, sent by God, had informed Mary of it. Shortly afterwards, Mary set out in haste for the hill country, to a town of Judah (Lk 1:39). She is not motivated by curiosity, nor does she make the journey to discover for herself whether the angel's message is true. Humble, filled with charity—a charity that leads her to be more concerned for her elderly cousin than for herself—Mary goes to the home of Elizabeth because she has discerned in the heavenly message a hidden relationship between Elizabeth's child and the Son she carries within her. It is a long way—nearly a hundred miles—from Nazareth to Ain Karim, the little town in the hills of Judea where, according to tradition, Zachary and Elizabeth lived. Most likely it was Joseph who arranged the trip, looking for a caravan in which the Blessed Virgin could travel safely. He himself may have accompanied her, at least as far as Jerusalem; some commentators even think he went with Mary right to Ain Karim, which is only five miles from the capital. If so, he would have needed to return immediately to his workshop in Nazareth. Mary entered the house of Zachary and greeted Elizabeth (Lk 1:40). According to a local tradition, the meeting of the two cousins took place, not in the town, but in a country place where Elizabeth—as the sacred text affirms (Lk 1:24)—had secluded herself for five months from the sight of curious relatives and neighbors, to raise up her heart in gratitude to God for such an immense gift. 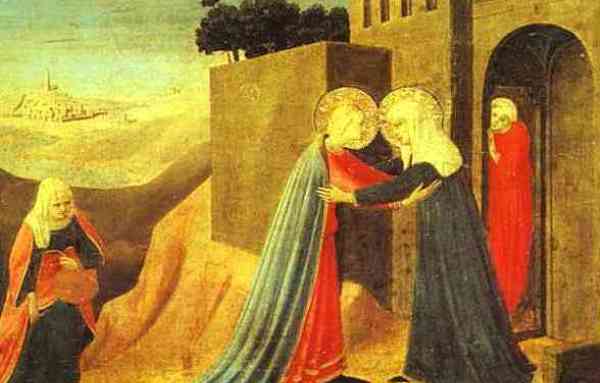 After the long and tiring trip, Mary greets Elizabeth with an embrace. Mary rejoices with her cousin and promises to stay at her side. With Mary, God's grace enters that house, for he has made her his mediatrix. Her arrival produces a spiritual upheaval. When Elizabeth heard Mary's greeting, St. Luke recounts, the infant leapt in her womb, and Elizabeth was filled with the Holy Spirit (Lk 1:41). Mary rejoices with her cousin and promises to stay at her side. With Mary, God's grace enters that house, for he has made her his mediatrix. Mary brings with her three gifts (Lk 1:42-45). First, she fills that house with glory: How is it that the mother of my Lord should visit me? 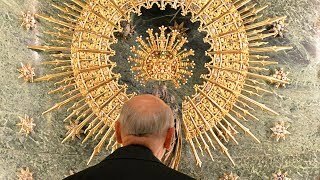 If a visit from an important earthly figure brings great honor to the person visited, what could be said of the honor of receiving the only-begotten Son of God the Father, incarnate in our Lady's womb? The unborn Baptist quivers and exults with joy, sanctified by Jesus' presence. And Elizabeth, enlightened by God's Spirit, breaks forth with a prophetic acclamation: As soon as your greeting reached my ears, the child leapt with joy in my womb; blessed are you who has believed that the things spoken to you by the Lord will be fulfilled (Lk 1:44-45). The Blessed Virgin had come to serve, but she finds herself praised, blessed, and proclaimed Mother of the Messiah, Mother of God. Mary knows this is so, but she attributes everything to the Lord: because he has seen the lowliness of his handmaid; wherefore all generations shall call me blessed. For he who is all-powerful has done great things in me, and holy is his name (Lk 1:48-49). The Magnificat, the canticle composed by our Lady under the inspiration of the Holy Spirit with expressions from the Old Testament, is a portrait of Mary's soul. The Magnificat, the canticle composed by our Lady under the inspiration of the Holy Spirit with expressions from the Old Testament, is a portrait of Mary's soul. It is a song to the mercy of God, who is great and all-powerful, and at the same time a manifestation of our Lady's humility. Although I have done nothing myself, she says, the Lord has wished to accomplish in me what He had announced to our forefathers, to Abraham and his posterity forever. My soul magnifies the Lord, not because my soul is great, but because the Lord has done great things in it. Mary is the humble handmaid of God and the servant of mankind. She remains three months in Elizabeth's home, until the birth of John. And with her presence, she will fill Zachary with grace as well, so that he might sing to the Lord a hymn of praise and repentance, with all the strength of his recovered speech: Blessed be the Lord, the God of Israel, for he has visited and redeemed his people (Lk 1:68).